Howlin' Wolf Records: SIX STRINGS: RLJ Entertainment: "THE LIMEHOUSE GOLEM"
RLJ Entertainment (NASDAQ: RLJE) is set to release the action film THE LIMEHOUSE GOLEM on DVD and Blu-ray on Nov. 7, 2017. Based on the novel “Dan Leno and the Limehouse Golem” by Peter Ackroyd with a screenplay by acclaimed writer Jane Goldman (Kingsmen, The Woman in Black), the film is directed by Juan Carlos Medina (Painless) and produced by Stephen Woolley (Their Finest, Interview with a Vampire), Joanna Laurie (Hyena) and Elizabeth Karlsen (Carol). THE LIMEHOUSE GOLEM stars Bill Nighy (Love Actually, Underworld), Olivia Cooke (Me and Earl and the Dying Girl, “Bates Motel”), Douglas Booth (Pride, Prejudice and Zombies, Noah), Daniel Mays (“Line of Duty”) and Eddie Marsan (Sherlock Homes, “Ray Donovan.”). The city of London is gripped with fear as a serial killer – dubbed The Limehouse Golem – is on the loose and leaving cryptic messages written in his victim’s blood. With few leads and increasing public pressure, Scotland Yard assigns the case to Inspector Kildare (Bill Nighy) – a seasoned detective with a troubled past and a sneaking suspicion he’s being set up to fail. Faced with a long list of suspects, including music hall star Dan Leno (Douglas Booth), Kildare must get help from a witness who has legal troubles of her own (Olivia Cooke), so he can stop the murders and bring the killer to justice. 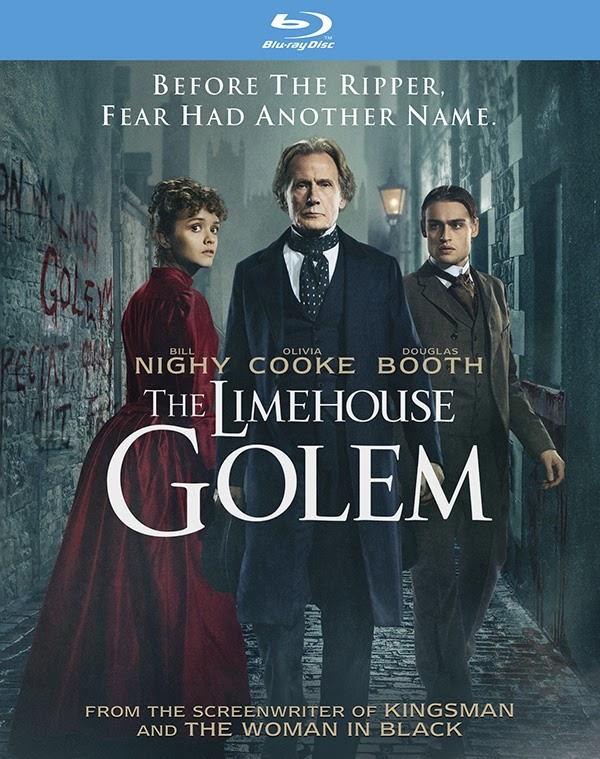 THE LIMEHOUSE GOLEM DVD and Blu-ray have bonus features that include behind-the-scenes featurettes about the cast, locations, look, and the making of THE LIMEHOUSE GOLEM. Worth a look, kept my attention from start to finish and it's visually stunning! Bill Nighy! He's a fun actor.